A premium is something you give away with a purchase. It acts as an incentive to buy. Usually it’s related to the product you’re selling, for example a travel adaptor with a set of luggage, or some fine tea and coffee with your new bone china dinner service. It’s also a great idea to brand the premium for extra marketing value. You might even get extra business from this – imagine a bike store which gave away branded puncture repair kits, complete with web and phone contact details, with every mountain bike sold. The store name is right in front of the rider at exactly the time his bike is off-road, exactly the time he’s thinking about a tune-up. There’s a high chance the store’s going to get more ongoing service business and increase the average value per customer. And what if the repair kit was a really neat design, maybe themed around bikes and easily fixable to a bike frame? Wouldn’t that help it stay in use and visible? In contrast to promotional premiums, used to encourage buying, an incentive is used to encourageselling. Top sellers, or those who hit a certain target level, get the item in recognition. There’s less need to tie the incentive to the actual product – the priority here is that it’s something which inspires and motivates the sellers. 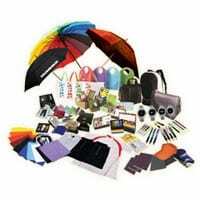 Giveaways, often used at trade shows or for existing clients and prospects, are all about branding. Your main goal is to have something the recipient really likes, actually uses, and even shares with others to help spread your brand. Not just another pen, but something creative, fun or useful. And once again, something which relates to your product or service is just perfect. There are hundreds of companies out there who’ll sell you promotional premiums, incentives and giveaways. If you do just want pens, your best option is probably to use one. But wouldn’t you do better with something which will really stand out, something not in all the promotional catalogues? Hornet can source hard-to-find items, in your brand colours or with your logo, or we can (and often do!) go that step further. You might want giveaway packaging custom-cut in the shape of your logo, or a small item like a mini-torch, USB or keyring manufactured to look like your product itself. Or you may have something really clever in mind which your normal suppliers just don’t know how to provide. Whatever your ideas, just ask Hornet – we can almost certainly help!